Erl Svendsen and Herman J. Seminiano were both Chicago natives who were transplanted to Brownsville, Texas. Herman tells me that though they met once they didn’t really know each other. Erl had been manufacturing guns of one kind or another since the 1950’s. Erl did business as the “Erl Svendsen Firearms Manufacturing Company” (ESFAC) and later as the “4 Ace Manufacturing Company.” His best-selling gun was a single-shot derringer called Little Ace, but he also manufactured a four-shot derringer called 4 Aces. These guns had brass frames and steel barrels and parts. Both were chambered for the .22 Short, but toward the end of production Erl began chambering 4 Aces in .22 Long Rifle, making it an effective defensive weapon for the first time. Around 1974 or 1975, for reasons I don’t know and can’t speculate on, Erl Svendsen filed for bankruptcy. Herman J. Seminiano was an engineer and tool designer who moved to Brownsville to start and run an engineering department at Electro Partes in Matamoros, Mexico for the Rauland Corporation, which was a subsidiary of Zenith Electronics. Herman had a Federal Firearms License and a longstanding interest in firearms. When, in 1974 or 1975, he saw that Erl’s company was being liquidated, he decided to buy it. His intent was to continue to manufacture Little Ace and 4 Aces. He obtained the remaining stock (which he eventually sold off) and tooling, which was mostly unusable, but when he asked to see the plans, he was told there weren’t any--they just copied the previous gun to make the next one. Herman discovered that every Erl Svendsen gun had been completely hand made and hand fitted--there were no interchangeable parts. Being an engineer, the idea of making guns with no plans and no interchangeable parts was completely out of the question. Herman Seminiano chose 4 Aces as the most marketable gun, and sat down to draw detailed plans with precise measurements of every curve and facet. Erl’s 4 Aces was a near reproduction of an old Sharps design with a birdshead grip. But Sharps had also manufactured the gun with a squared-off grip, and Herman decided to change his design to the square grip frame so the gun could be more easily grasped. He also designed an internal safety lever that prevents the hammer from falling if the barrels are not locked securely against the breech block. The HJS derringer has four two-inch rifled barrels drilled into a single piece of steel. A lug on the bottom of the four barrels fits into a slot in the frame. 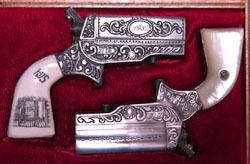 The barrels are held in the frame by a latch mechanism that is nearly identical to that of the 1859 Sharps derringer, with a release button on the bottom of the frame. The hammer is tensioned by a flat spring in the grip. The hammer features a rotating firing pin originally patented by Christian Sharps in 1859--each time the hammer is cocked a pawl rotates the firing pin 90°. Preparing for production of the HJS took time, as instructions had to be written detailing every step of the machining and assembly process. The new gun would be made from stainless steel so it could fire high velocity .22 Long Rifle cartridges. 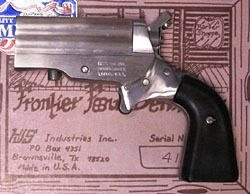 In 1983 Herman formed HJS Industries Incorporated to manufacture his new gun, which he called the Frontier Four derringer. 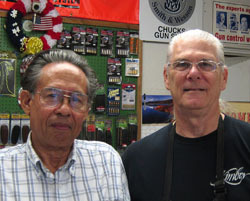 Charles “Chuck” Fredieu, owner of Chuck’s Gun Shop in Brownsville, Texas, machined parts for some of the early guns. Chuck was an ex-Navy man who had competed successfully on the U.S. Navy pistol team. Chuck was instrumental in helping me contact Herman Seminiano in order to write this article. The company lasted from 1983 to 1985 when a distributor reneged on a deal to distribute the guns and left them with insufficient cash to continue operations. 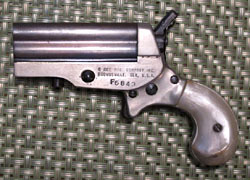 HJS Industries manufactured 4169 Frontier Four derringers. Most were chambered for the .22 Long Rifle cartridge, but the company also manufactured a few flat-sided single-shot guns chambered for the .38 Smith & Wesson cartridge. This was known as the HJS Lone Star derringer, and is quite rare. All guns were marked on the left side of the frame in all capital sans-serif characters on three lines HJS IND. INC. / BROWNSVILLE, / TEXAS, U.S.A., and on the right side .22 CAL. or .38 S&W. The serial number was on the base of the grip. In 1991, Herman decided to try the business again, forming HJS Arms Incorporated. 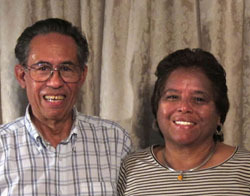 He and his wife, Amalia Martinez Herrera worked in the business from 1991 through 1993. Again, the guns were mostly chambered for the .22 Long Rifle cartridge, but a few flat-sided single-shot Lone Star derringers were chambered for the .380 ACP cartridge. Also, some of the Frontier Four derringers were made with brass frames and blued barrels. Total production of the second company is not known, but may be less than 3000 pistols. All guns were marked on the left side of the frame in all capital characters on three lines HJS ARMS INC. / BROWNSVILLE, / TEXAS, U.S.A., and on the right side .22 CAL. or .380 ACP. The serial number was on the base of the grip. 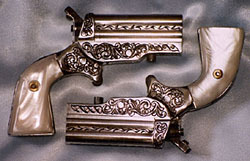 The company made two engraved Frontier Four derringers that were used in the 1994 movie Maverick, starring Mel Gibson and Jodie Foster. 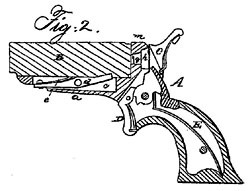 Christian Sharps received a patent on his four-barrel derringer on 25 January 1859, claiming two innovations: "Exploding in succession a number of cartridges ... by means of a projection caused to revolve by the movement of the hammer ...," and "...catches ... so arranged on the stock in respect to the bores of the barrel-block that on moving the latter from the breech they may be the means of withdrawing the whole of the cartridges simultaneously from their respective bores..." (U.S. Patent 22753) Interestingly, the spring extractors were not reproduced in the 4 Aces or the Frontier Four. The Gun Digest Book of Revolvers Assembly/Dissassembly, by J.B. Wood. Krause, Iola, WI: 2011. “The HJS Frontier Four .22 Derringer,” by Phil Spangenberger. Guns & Ammo, July, 1982. “The HJS Lone Star Derringer,” by Phil Spangenberger. Guns & Ammo, September 1, 1985.